“Stop the car RIGHT NOW!” I ordered to Justin as my eyes affixed on the quickly passing Roy’s Motel sign on the passenger side of the car. Obediently, he cocked the steering wheel to the right and we skidded to a stop on the gravel shoulder from about 55 miles per hour in a cloud of dust. The lengths that I go to for a photo-op is sometimes extreme! 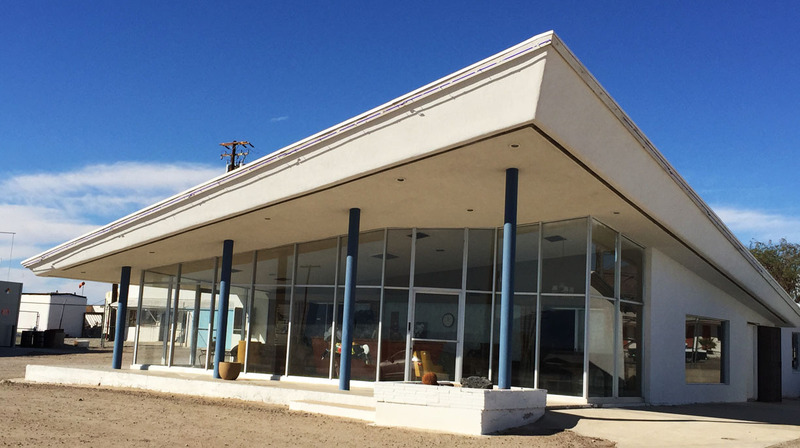 What had caught my eye was a remnant of old Route 66: A true time capsule of architecture from 1936 in Amboy, Nevada that stood as a reminder of what the Mother Road once was. Justin positioned the ILX for a photo op and I immortalized the moment digitally for you all to enjoy. Determined to keep the weekend fun going, on the heels of our Zion National Park hike, Justin and I decided to explore some new turf and visit friends in Palm Springs, California. My mom served up some delicious sourdough French toast and we hit the road with a full tank of gas and full stomachs. The 100 mile stretch between St. George, Utah and Las Vegas, Nevada was a repeat for me as I’ve driven it hundreds of times. Still, the Virgin River Gorge through the northwest corner of Arizona always provides amazing views in any direction. In its day, it was one of the most expensive stretches of interstate in the country. 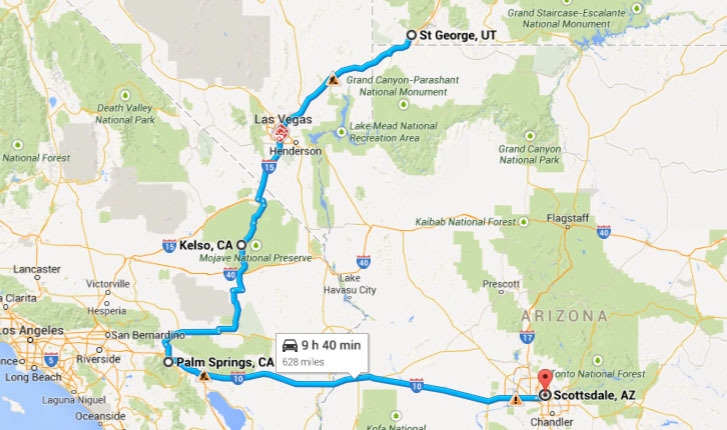 It was the route we took after rolling through Las Vegas that brought some excitement to the adventure. Shortly after crossing into the California state line (and passing the landmark “Buffalo Bill’s” casino & rollercoaster) in Primm, we rolled onward for only about another 10 miles on Interstate 15 southbound before exiting on Nipton Road at mile marker 286. I turned over the ILX reins to Justin for a little while. 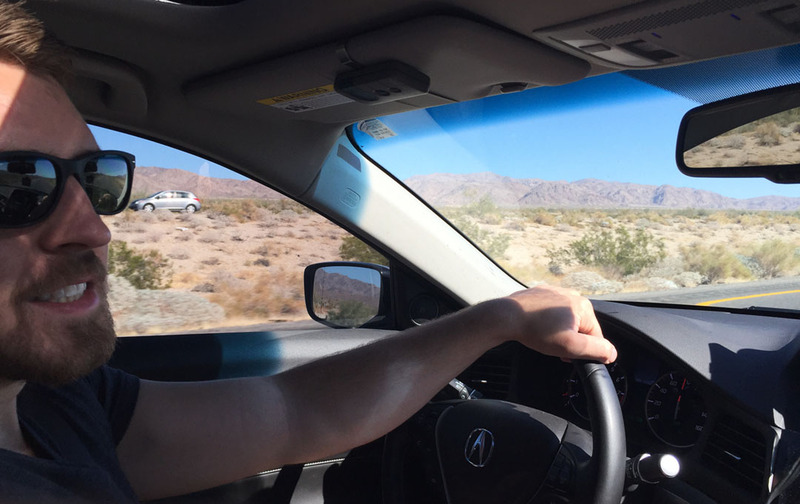 The next few hours were spent in the desert backcountry – winding our way along two lane highways that combined whoop-de-doos, seemingly endless straightaways, and plenty of roadside scenery to enjoy. Pavement conditions were less than optimal, as Justin frequently had to dodge huge potholes while clipping along at 65 to 75 miles per hour. At least the ILX steering is pretty responsive. It’s a good thing we had fueled in up Las Vegas because amenities were extremely sparse out there. 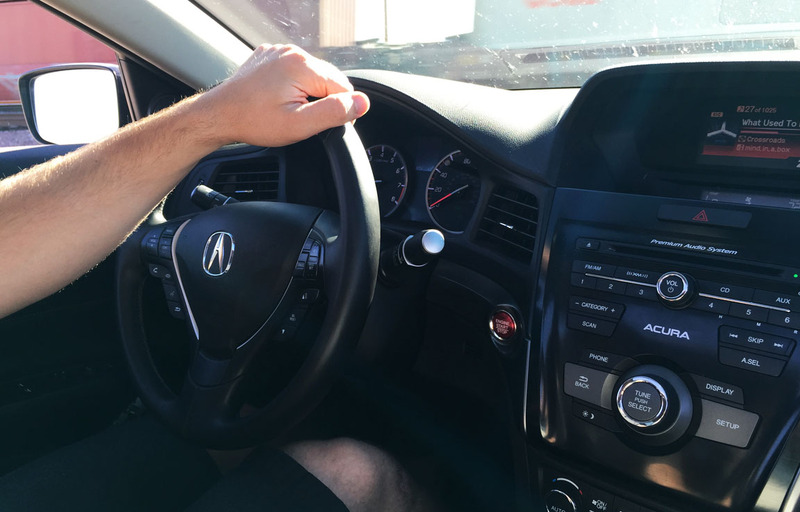 We rolled around with windows down, moonroof open, and music blaring — the temperatures were perfect for an open-air cruise. We blasted through the town of Cima without even batting an eye, but Kelso was worth a closer look. 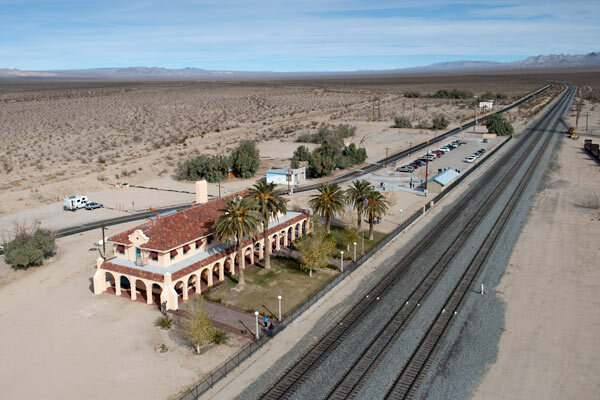 It got its start in 1905 as a railroad depot for the line between Utah and Los Angeles. There’s not a heck of a lot to see or do in Amboy today, but just a bit to the west (and visible from the highway) is a 6,000-year-old cinder cone volcano that looks like it would be fun to hike around in or on. 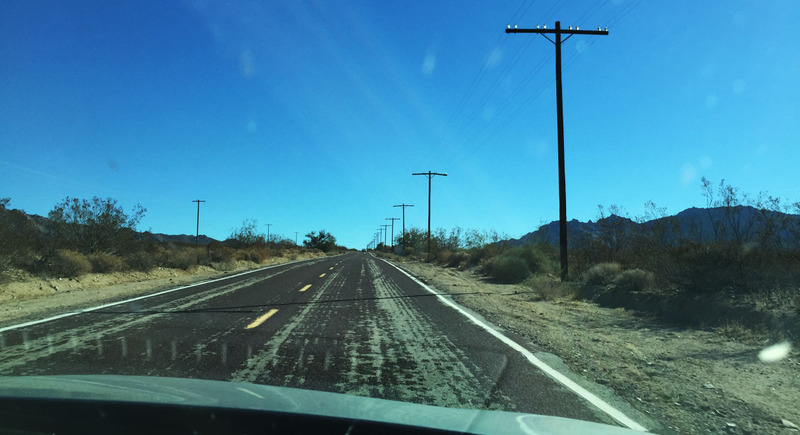 Our destination in Palm Springs awaited – and Justin was anxious to pick up the pace – so we moseyed onward. 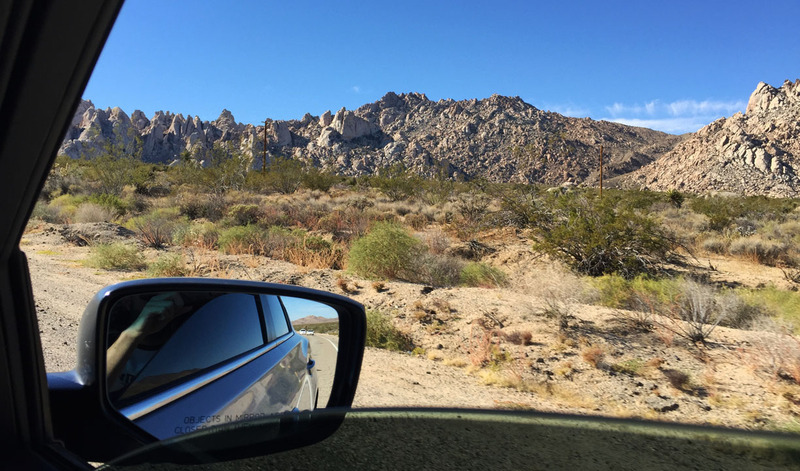 We breezed through State Route 62 in the town of Twentynine Palms, named by a colonel who surveyed the land in 1852. Palm Springs was just another hour beyond that, and we arrived just in time for a fantastic sunset. Here are the rest of the pictures from this leg of the journey. 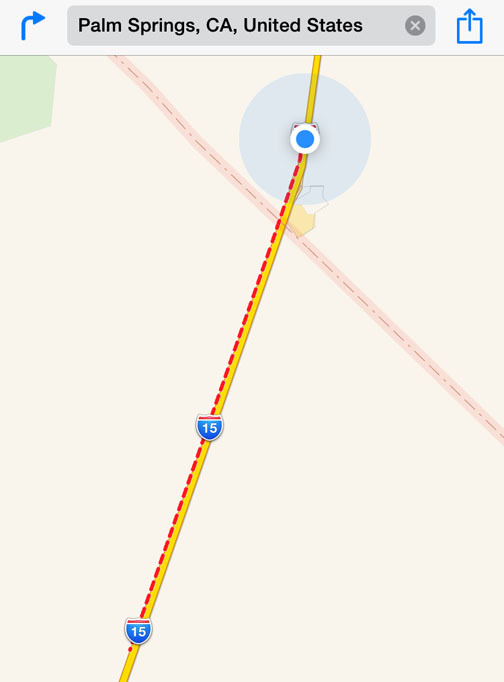 Accident-induced traffic at the NV/CA state line near Primm. All that red! 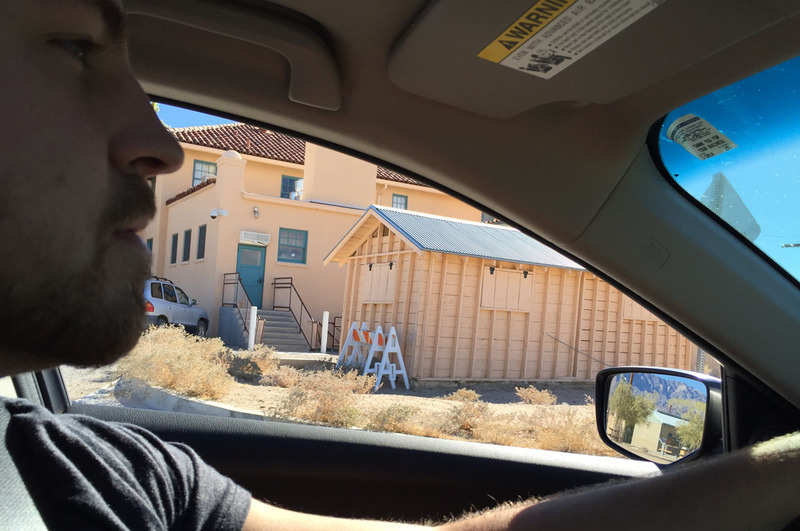 Justin driving past the Kelso railroad depot. I loved this straightaway with telephone poles running parallel to the road. 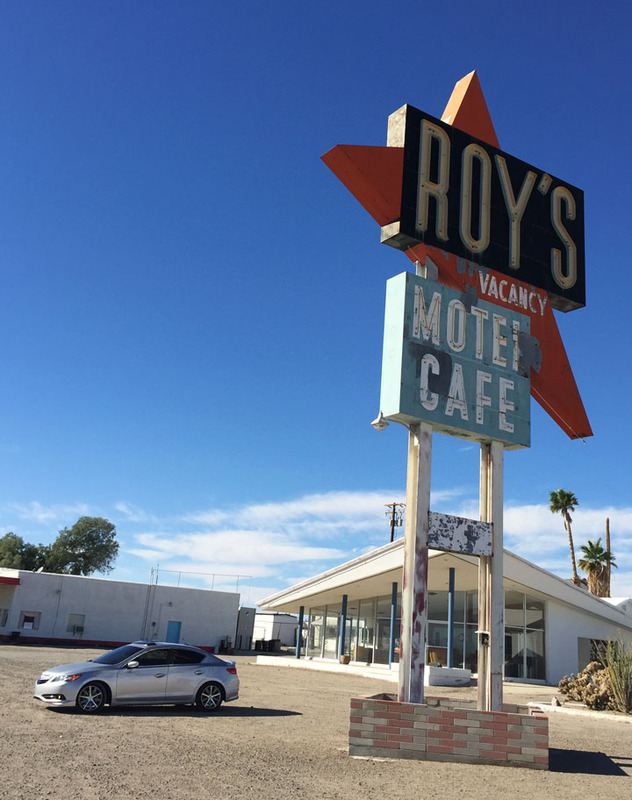 Arrival at Roy’s in Amboy, California. Look closely for a special message Justin sent me from the moonroof of the car. 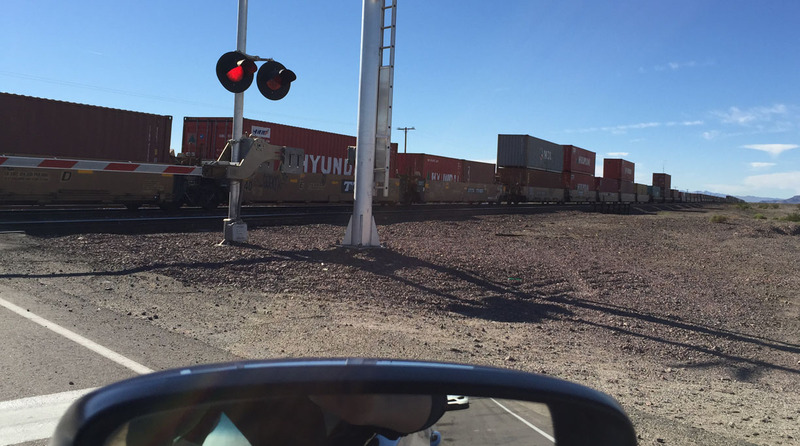 Waiting for a freight train to pass by. 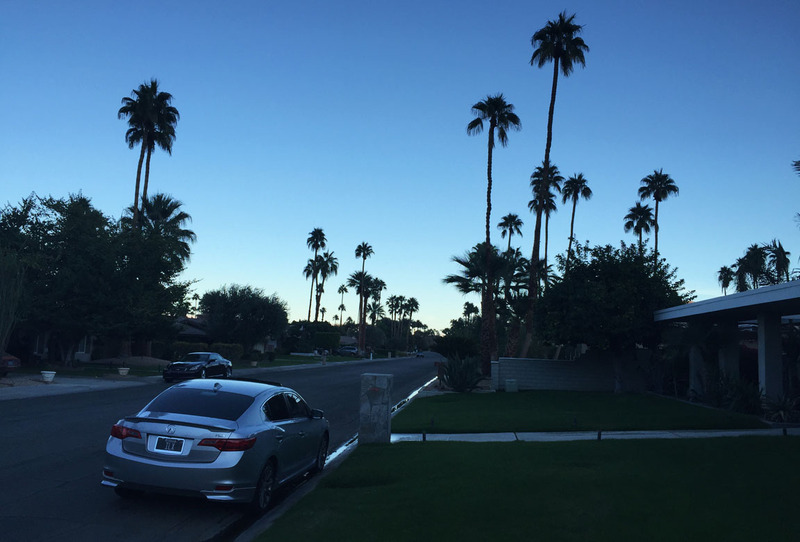 Monday morning: heading back to Phoenix from Palm Springs. 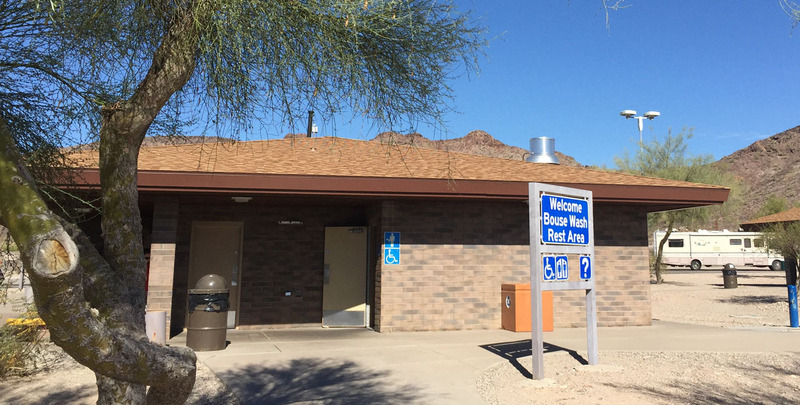 Rest area just east of Quartzsite, Arizona. Love how friendly the interpretive signs are: “Enjoy Arizona.” We sure did! 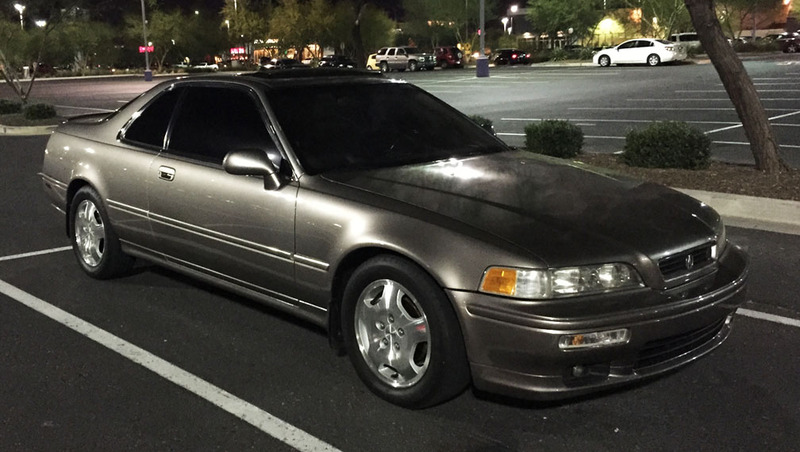 This entry was posted on November 14, 2014 at 4:48 pm and is filed under Arizona, California, ILX, Road Trip. You can follow any responses to this entry through the RSS 2.0 feed. You can leave a response, or trackback from your own site. Looks like Justin got the hang of the old six-speed quickly. Kudos! He sure did! 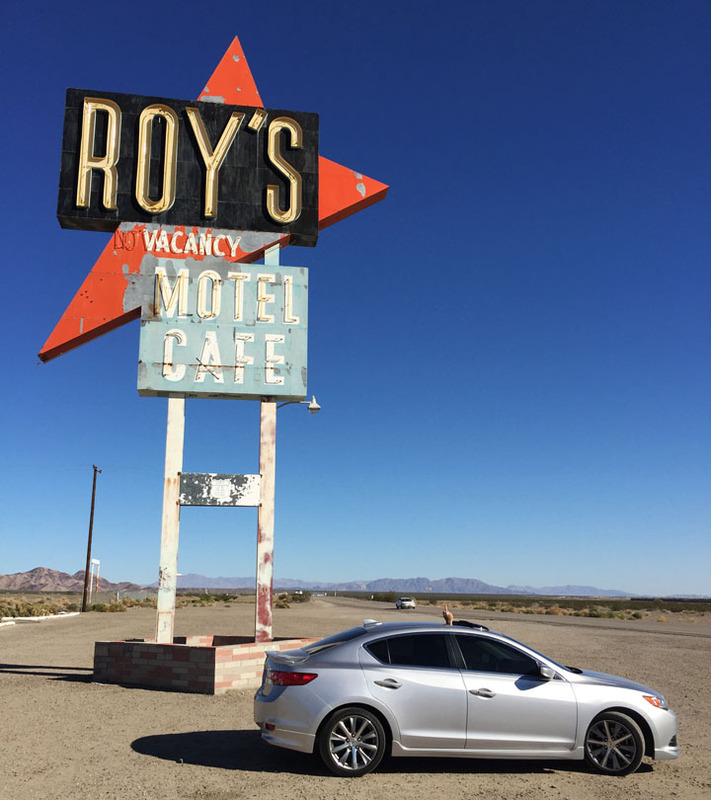 The ILX is a pretty easy car to learn on. It even has that ‘hill assist’ feature that won’t let you inadvertently roll backward into the car behind you. Kids these days have it easy with all this technology! Just a short jaunt over to Palm Springs. Looks like the same kind of weather we are having up here in the NW but I can tell you our temps. are about 40 degrees cooler! Yeah this is the time of year when we really love our weather in the SW! But we paid for it dearly from about May through September! 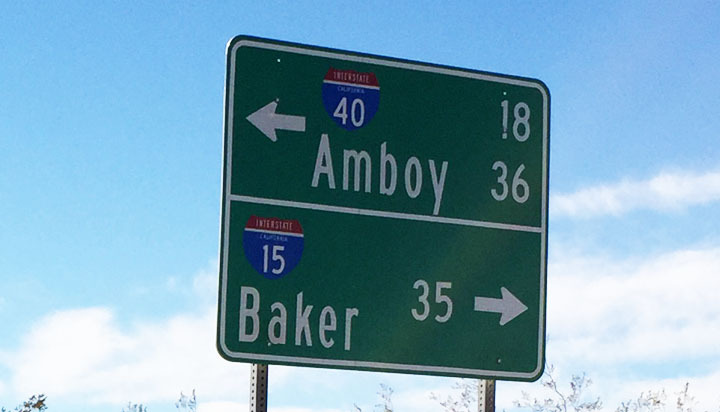 I know you posted long ago about Roy’s, but I am still mulling over the vision of Amboy being a thriving metropolis. There is a carousel horse in the motel lobby, for Pete’s sake! Ha. Population of 4. Did you see the post office across the street from Roy’s? I don’t remember seeing the post office! Guess I need to plan a trip back!